Seven years after their last studio album Return To Heaven Denied Pt. 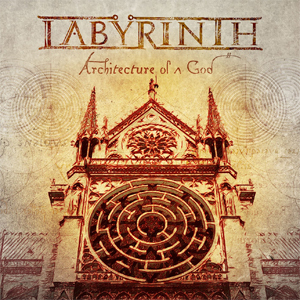 II: A Midnight Autumn's Dream, Italian power metal veterans LABYRINTH are finally back with their new, self-produced album Architecture Of A God. Founded in the Tuscan town Massa in 1991, LABYRINTH became one of the power metal protagonists when the sub-genre enjoyed a growing popularity in the late 1990s and early 2000s, especially over here Europe. The band's history has been marked by many line-up changes with quite a number of stellar musicians joining and leaving LABYRINTH, whose dramatis personae includes illustrious names such as vocalists Fabio Lione, who, after leaving the band, joined RHAPSODY (OF FIRE), as well as Mark Boals, probably best known for his work with Yngwie Malmsteen. The new LABYRINTH line-up is composed of Roberto Tiranti (lead vocals), Olaf Thorsen (lead guitars), Andrea Cantarelli (lead guitars), Nik Mazzucconi (bass guitar) and Oleg Smirnoff (keyboards). If you're looking for epic sounds, breathtaking vituosity, soaring vocals, catchy melodies and an occasional dash of cheesiness, then power metal is your genre. If you're looking for originality, complexity in rhythm, harmony and arrangement, you may not so easily find all that in power metal, of course, you turn to the new LABYRINTH release. Amongst typical power metal numbers combining awesome playing with extremely melodic hook lines – like the opener “Bullets”, the up-tempo “Take On My Legacy” and “Stardust And Ashes” – there are many prog-infused moments that make this solid power metal album special. There is, for example, “Still Alive”, a catchy mid-tempo rocker that is built on a solid bass guitar groove and whose synth and acoustic guitar sounds add sonic depth it while Roberto Tiranti's high note at the end of the last chorus may pose a serious threat to your glass windows.
. Like many albums of that genre, LABYRINTH's Architecture Of A God tends to be on the border of being slightly overproduced and some parts do suffer from too much keyboards and too many power metal clichés – at least for my taste. Nevertheless, it is a great sounding record with many surprising moments, exciting ideas and superb playing and singing. Grab your copy of Architecture Of A God in the KNAC.COM More Store right HERE.